According to Payments Global Report, published in November 2017, Argentina has the highest penetration of credit cards in Latin America and it is bigger than several European countries. More than 86% of the 43 million inhabitants have internet access, which represents a great business opportunity for digital companies that want to increase sales in the country. Online shopping confidence has also increased a lot. “Being more comfortable with credit cards operations helps growth, but cash payments meet the demand of consumers who still have issues with security when buying online or do not have a card or a bank account”, explained BoaCompra Payments Director, Fernando Estevez. Argentina can be a complicated market, but there is plenty of room for growth with internet available and more people buying online each year. “Installments are crucial specially for high value purchases. If an International company wants to truly enter Argentina, local options with installments, cash payments like Rapipago or Pagofacil need to be offered” said Fernando Estevez. With an estimated GDP of US$ 629 billion, ecommerce keeps growing year after year on double digits with a 20% growth projection for 2016 alone. 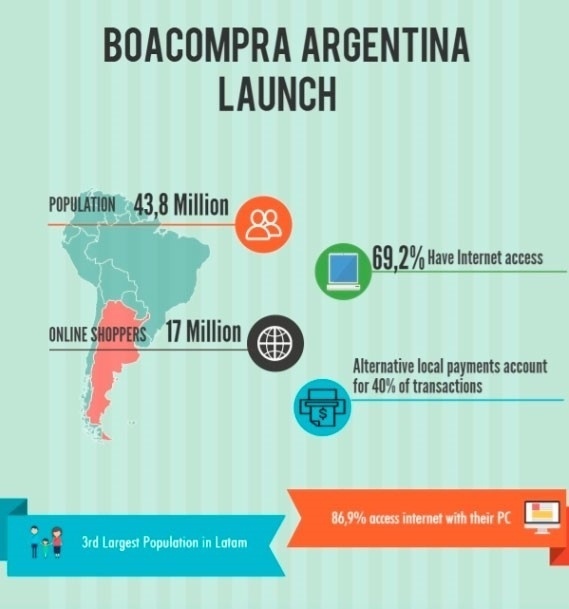 “BoaCompra has developed the best connection with local players to be able to offer local bank transfers, local credit cards and local cash payments ", concludes Fernando Estevez.